You’ve just received your brand spanking new Workcycles bike and are looking forward to swinging your leg over (or though) it. We’ve built it, checked it and test ridden your bike but unfortunately we then had to partially disassemble it to fit it into its box. Thus it’ll have to be reassembled properly. The steps below cover the basics of any of our city or transport bikes. 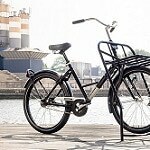 The bike in the photo series is from our Classic series: a Kruisframe (Pastoorsfiets) LX-NN8D. It’s likely that your bike differs in some ways but the basic principles will be the same. With each step I’ll add some notes about how other models might differ. Performing the assembly is critical to your safety, the smooth functioning and longevity of your bike. Though it’s not difficult some basic mechanical skill is necessary. If you’re not confident you can do it yourself I recommend enlisting the help of a handy friend. If that’s not possible then bring the bike to a bicycle shop to have it completed. 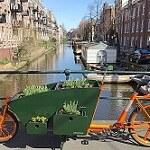 This process would take a Workcycles mechanic about ten minutes, a bike mechanic not familiar with these bikes 15 minutes, and an average mechanically handy person 20-25 minutes. Just take your time to do it properly. 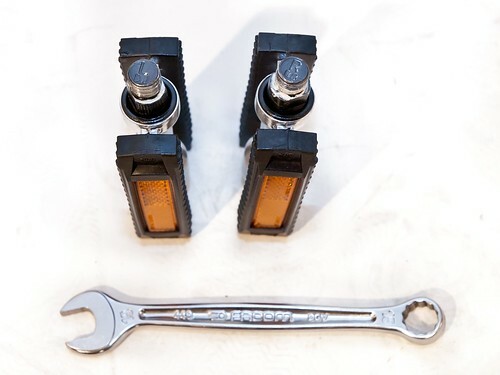 Note: We really recommend against using an adjustable wrench instead of the correct individual sizes since both the fit is better and the chance of damaging paint is much smaller. Also adjustable wrenches are often too thick to fit some of the fittings. Open the box from the top and remove the front wheel and fender and any other parts that can be reached from the top. Place the various painted parts somewhere safe from feet and things that could scratch them. Remove, if present, the inner cardboard wall used to separate the wheel/fender from the frame. Now you can lift the bike out of the box. Probably it’ll be much easier to have a friend help with this step because various parts of the bike tend to grab the box. 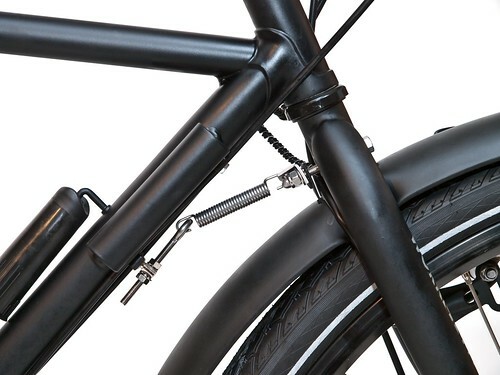 The handlebar stem is secured by a wedge pulled by a long bolt from the top of the stem. The bolt just pulls the wedge so it’s not necessary to turn it any more than necessary to loosen or tighten the stem quill. In fact loosening it too much will let the wedge fall off the bolt into your steerer tube, leaving you to find creative ways to retrieve it. Note: The headset bearing locknut is not related to securing the stem and should not be adjusted in this step. Rotate the fork 180 degrees so that the “rake” (forward curve or angle of the fork blades faces forward. Turn the handlebar/stem/brake lever(s)/shifter unit so that the cables aren’t twisted amongst each other. Using a 6mm socket wrench loosen the wedge just enough to fit the stem quill into the fork’s steerer tube. Push the stem about halfway into the fork and lightly secure the wedge bolt. Don’t worry about the alignment at this stage. In fact deliberately secure the handlebars twisted now to make sure you don’t forget to tighten this properly later. 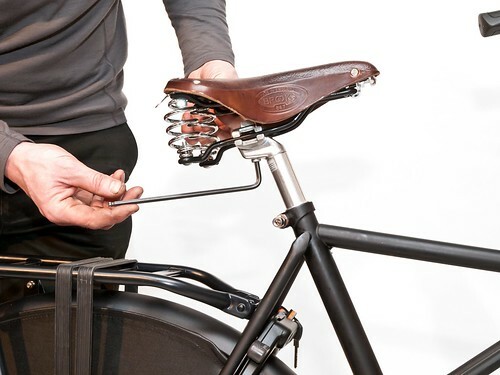 This is probably the trickiest and most critical part of the assembly and it’s very handy to have a helper hold the bike upright while you align the various parts and slip the front wheel in. Note: If you’re working on a Fr8 with the Massive Rack front carrier you’ll need to first install the carrier. See below. 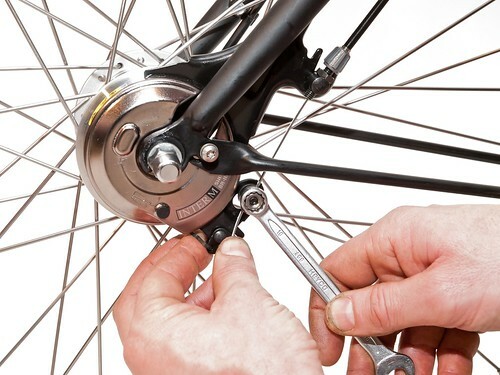 With a 15mm wrench loosen the axle nuts enough to be able to slip the axle into the fork. Orient the wheel in the correct direction: roller brake on the left, hub dynamo connector on the right side. Pull the axle washers to the outside, against the axle nuts. 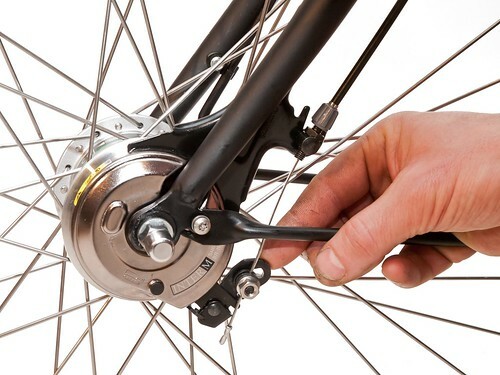 Point the brake reaction arm upwards in order to slip it into its holder on the left fork blade. We’re ready to install the front wheel. 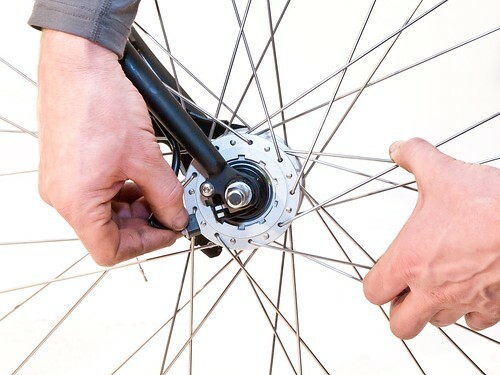 Using your three hands to simultaneously hold the two axle nuts/washers, the fork ends, and the brake reaction arm guide the axle into the fork ends while slipping the end of the brake reaction arm into the holder on the inside of he left fork blade. It might take you a few tries. Once the axle and reaction arm are in place rotate the dynamo wire contacts so they face to the rear. The exact angle isn’t important. Now you can secure the axle nuts: Have your helper (or your other hand if you’re quite handy) press downward to hold the axle in the fork ends. Lightly tighten one axle nut, making sure that the dynamo wire contacts don’t rotate. Now pulling the rim against the fork blade to snug the axle up into the fork end lightly tighten the other axle nut. Loosen the other axle nut and do the same pull rim to snug axle nut procedure. 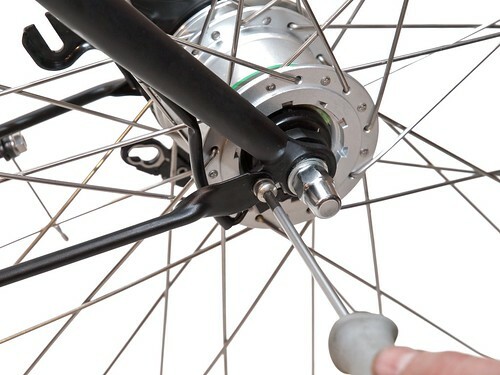 Sometimes one step is enough to get the wheel aligned in the fork. Other times require repeating this process a couple times. 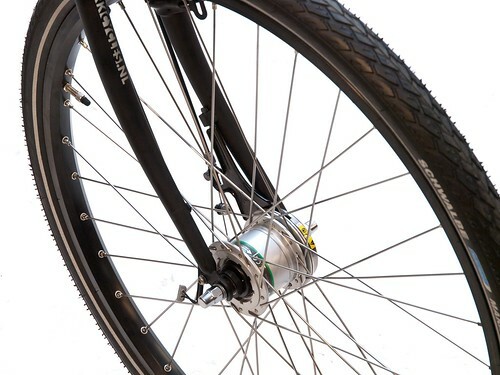 Once the axle is properly sitting in the fork gradually tighten the axle nuts on either side. You can now click the connector for the dynamo wires in place onto the hub contacts. The tapered part of the connector goes on the outside. The order of assembly is not critical but it will be much easier to do the rest of the work once the bike can stand on its own. 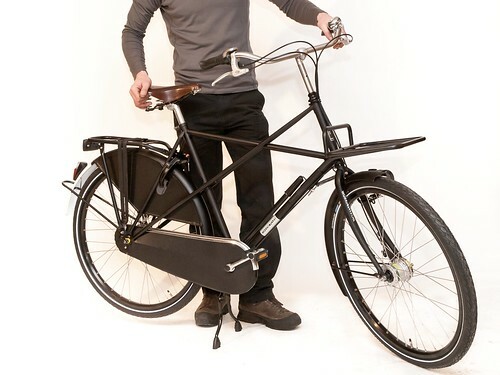 This bike is equipped with a center stand but the installation is almost identical with a sidestand. Make sure the stand is folded into the riding position. If it’s not already like this fold it up… being careful not to pinch fingers or skin. The parking stands are secured with different bolts, and in some cases, a plate above the chainstays. Thus you might need here a 17mm or 19mm wrench, or a 6mm or 8mm hex key. If your bike requires a top plate, first place it over the chainstays with the narrow part forward. Often it fits better with the chaincase when angled slightly back on the chaincase side. Slip the bolt through the frame’s stand mount (or top plate if present). Align the stand over the lip below. Engage the threads and tighten very securely. The fender and the steering stabilizer spring tab are attached with the same M6 bolt through the fork crown. First slip the bolt through the fork from the front with a washer between the bolt head and the fork. At the back the order is: fender mount tab, spring tab, washer and then the nut. Be sure to tuck the lighting wire between the fork and the fender mount tab to hide it. Press the fender up into the fork crown and align it while tightening the bolt with two 10mm wrenches. The spring tab also needs to be pointed upwards so align this just before finally tightening the bolt. 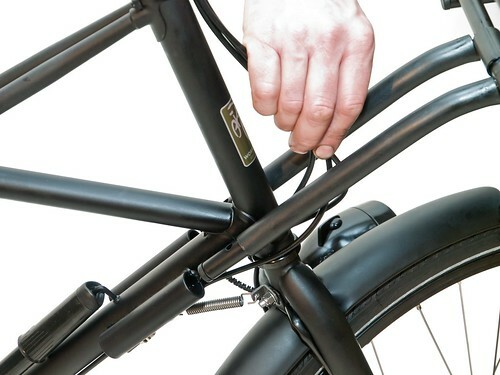 Using the two small M5 screws attach the fender stay to the fork ends. By shifting them back and forth on either side the alignment of the fender can be adjusted. These screws require either an 8mm wrench or T25 Torx key, or occasionally a 3mm allen key. To attach the stabilizer spring loosen the tension adjustment nut on the eye bolt enough to hook the spring between the eye bolt and the tab on the fork. Then tighten it up just enough to hold the front wheel reasonably straight with the bike standing. 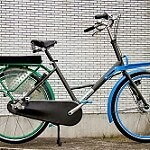 Most Workcycles bikes have Shimano roller brakes, of which there are several models, each of which with its own cable connection method. Occasionally the quick release mechanisms allow the cable connector nut to be removed and reinstalled from the hub brake unit without loosening the bolt… but usually it’s just not possible. I’ll assume here that it’s necessary to reattach the cable connector nut. For this task you’ll need a 10mm wrench. A box end is most convenient. Fit the cable connector nut through the matching hole in the arm of the brake and tug upwards to secure it in place. 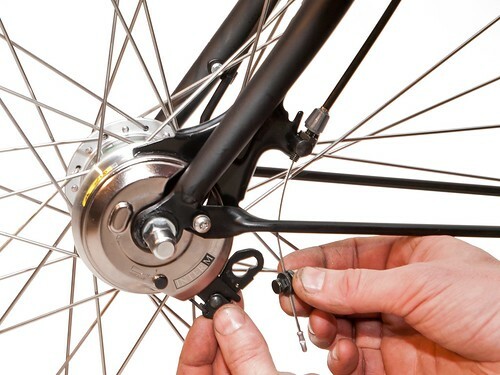 Since this bike has already been assembled you can simply reinstall the cable connector nut in the same place it was previously clamped. 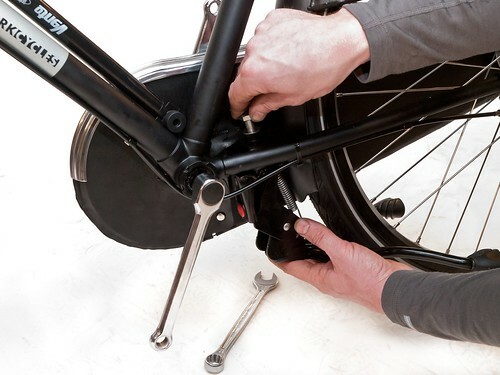 Check the operation of the brake with a couple firm squeezes and if needed adjust the free play a the lever with the barrel adjusters at the brake and lever. There are right and left pedals, the difference being that the left pedal has reverse threads. That is, you install it by rotating the axle counterclockwise. The left pedal is marked with an “L” and often with a textured (ridges) axle. The right pedal has an “R” and a smooth axle. Carefully thread the pedals in and secure them with a 15mm open end wrench. In a city where bikes are parked together densely in racks it’s important for the brake and shifter cables to be tidily secured to your bike. Otherwise they’ll tend to get caught on other bikes and damaged. The best way we’ve found to secure them neatly yet flexibly is with a humble tie-wrap. 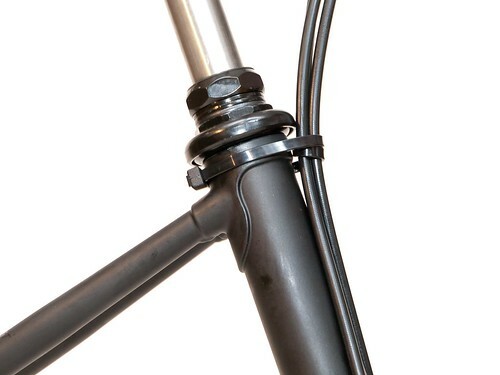 Wind the tie-wrap around the cables with a loop and then around the head tube, as in the photo. It can always be cut off and replaced for service. If your bike doesn’t have a front carrier you can obviously skip this step. 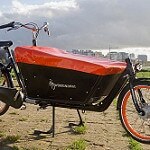 Depending on the model of Workcycles bike the front carrier is installed with one of three different systems. Like the other classic series city bikes and the Secret Service this Pastoorsfiets has a pair of tubes on the downtube into which the carrier’s support tubes slip. So for this type of carrier just hold the cables and slip the support tubes into the mounting tubes on the frame. Slip the M6 bolt though the hole at the end of the support tube and secure to prevent theft. You can ignore this step if you’re so lucky to live in a place where this isn’t necessary. 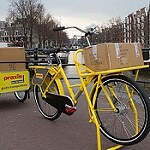 The Fr8 City carrier is similar but mounts with four M8 bolts to the downtube. The installation is self explanatory aside from the need to be careful to hold the lighting wires out of the way when slipping the carrier over the frame. The Fr8 Massive Rack installation is somewhat more involved, as befitting a rack with a 150kg load capacity. 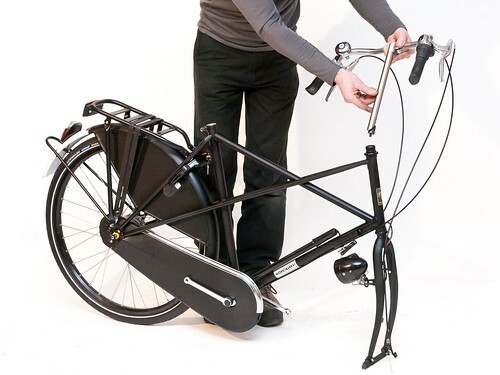 It’s highly recommended to hang the bike for this operation and a second pair of hands would be handy too: With the front wheel removed carefully slide the carrier’s support tubes into place next to the downtube. Shifter and rear brake cable go between support tubes while the front brake cable runs outside. Be careful to hold the lighting wires out of the way to avoid damaging them. Thread the four mounting bolts in, taking care not to cross-thread them. Then attach the upper clamp and tighten all of the bolts. Now you can install the front wheel. We’ll soon be adding another page about bike fit so I’ll keep it to the basics here. Saddle angle: This is a matter of preference but with an upright sitting position it’s generally best to have the saddle’s nose somewhat higher than the tail. This is particularly true for the Brooks B67 we fit to many bikes. Women tend to prefer the saddle with less of an upward angle. Saddle fore & aft: Again a matter of preference as the usual road racer advice of “knee over pedal spindle” is too far forward for upright bikes. Actually we tend to only move the saddle from the neutral position when necessary; for example to make more room for a child seat in front or behind. Saddle height: Again the standard road racer’s advice isn’t so helpful here. Consider the biomechanical ideal height (a very slight bend in the knee at the bottom of the pedal stroke) the maximum and then strive to find a balance between this height and being able to put a foot securely on the ground when stopped. Carrying kids, being a less confident cyclist and lots of stop and go cycling are all reasons for a lower saddle position. If you feel pain in front of your knees raise the saddle a little. Handlebar height: There’s really no right or wrong here but there are some considerations. 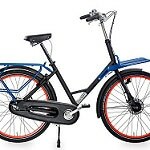 You’ll be able to ride more powerfully with the handlebar lower but being a city bike it should be comfortable. 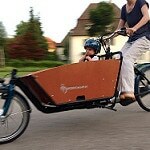 With a front child seat it’s often necessary to raise the handlebar for the child’s and your knee clearance. Handlebar angle: Strive for a comfortable, neutral wrist angle. 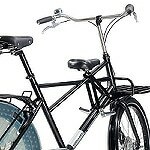 The ends of the handlebar will slope downward somewhat. Experiment to find the best position. Brake lever angle: Dependent on the type of handlebar and relative height of handlebar to saddle. 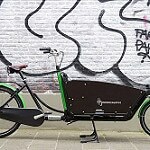 With the classic, square bend handlebar on this Pastoorsfiets the brake levers should point almost downward both because it’s most comfortable and because it prevents damage when the bike falls over. 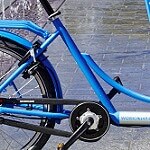 Other handlebar bends will have the levers angled higher. And just in case you forgot, now is the time to tighten your stem’s wedge bolt properly! 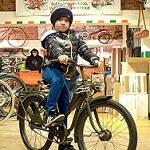 I wish you a smooth assembly and many years of happy riding on your Workcycles bike. I love it!! Great tutorial (and confirmation that I did the right thing)! How might someone in America (perhaps Michigan) buy one of your beautiful bikes (like the one in this post)? 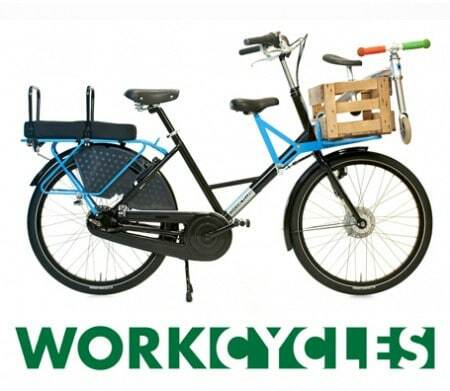 Just visit the Workcycles website (www.workcycles.com) for more info. In a nutshell we have a handful of dealers in the US but currently none near Michigan. 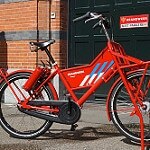 We can ship a bike directly to you from Amsterdam. Help! I love my bike- but I have not connected the lights correctly I think. What should I check to ensure the lights are connected so they work? Can someone help me troubleshoot? 0. Which light doesn’t work, or is it both? 1. Is the headlamp switched on? 3. Are the front wheel axle nuts tight? 4. 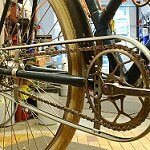 Is the serrated axle washer contacting the front fork? 5. Are the wires connected securely at the hub, headlamp and taillamp? 6. Could the wires have been reversed at any of the above? In other words did one come loose and have to be reconnected? I built my FR8 over the weekend and I think everything looks right, but I have 12 hex bolts & washers sets left over, are these just for future accessories? Can you also confirm that the FR8 rack only needs one washer for each bolt? This is my first bike with hub gears, is it OK to change gears while you are pedaling? Hmmmm, 12 extra sets of hex bolts and washers? Either your bike is going to fall apart spontaneously or we should send an extra invoice for all those extras. Maybe send a photo and I can try to guess further. For the front carrier we add washers between the carrier and frame to fill the space on the Fr8 Crossframe (which has a smaller diameter downtube than the Universal frame). 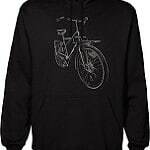 You can change gears while stopped, pedaling backwards or forwards. Just try not to shift while pedaling with force. I don’t think the bolts belong to my bike, but I will use some of the extra washers to fill the space between the carrier and cross frame. I am really enjoying the bike, I haven’t owned a bike in over 10 years and I just wish I had bought one sooner. I have thoroughly enjoyed my Secret Service bike over the past 18 months. So much that I sold my car! I have put 4500 miles on it and I wonder about the maintenance. Should I have the Nexus 8 speed hub rebuilt? It shifts fine, so I worry about fixing something that isn’t broke. Your thoughts? Hi, I am trying to assemble an FR8 out of the box. I followed the tutorial above, but sometimes got lost as the model above is not the same. Do you have step by step instructions for the Fr8 or an instructions manual? Am particularly lost on wiring the Shimano IM80 front handbrake. At current lenght the wore is too short, but I cannot loosen the bolt holding the wire. Also the spring connecting the front wheel to the frame was missing from the box.